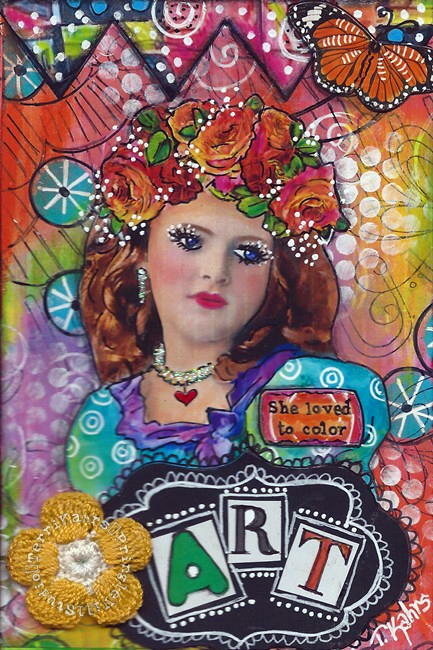 Although I've continued to participate in the Documented Life Project, it was a nice change of pace to create a postcard for a private swap. I haven't created a new digital image in ages, so it was fun to sit down for an afternoon to "colorize" a black and white photo of a little girl. First, I digitally enhanced the picture, and then I poured on the mixed media. Since I like to keep copies of my artwork, I scanned the finished piece to add to my file; however, the most interesting thing happened: The little crocheted flower at the bottom of the postcard was read by two scanners as being "yellow", when it's actually a very bright and vibrant orange!!! Several members of the Documented Life group have asked me to think about doing a tutorial. I'm entertaining the idea and welcome your thoughts and comments about what you'd like to see me share. Wishing you a bright and very colorful day! 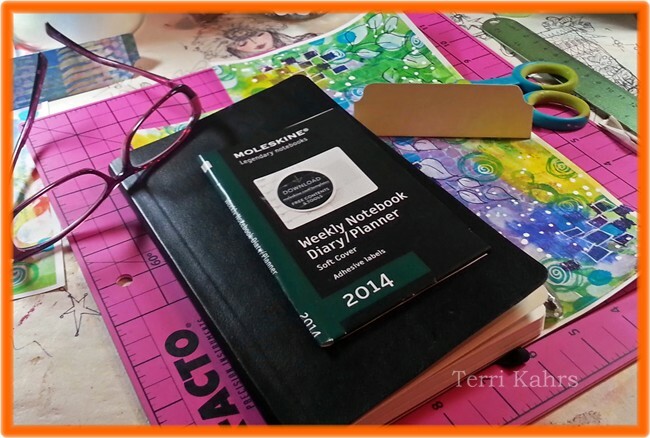 The Documented Life Project - Welcome 2014! It's been a-g-e-s since I've written a blog post. Admittedly, I'm a bit rusty in the "Blogging Department". I've been on a healthcare sabbatical of sorts for the past two years: First, taking care of my husband, and last year my Mom was taken seriously ill. My days have been filled with hospitals, rehab centers, doctors consults, social workers and nurses. As John Lennon would have said: "life happened". 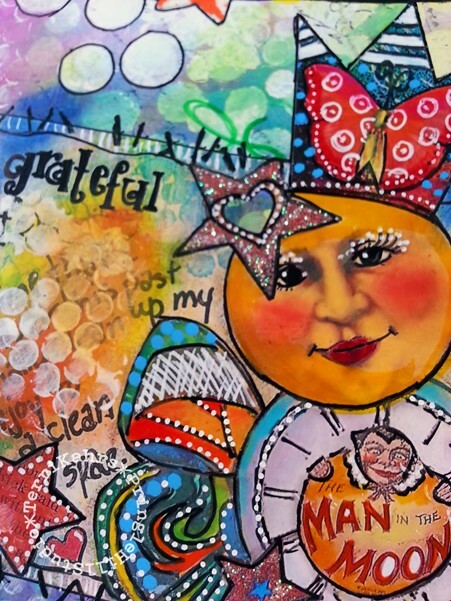 I've always believed that family must come first; but, my art and the effusive, saturated colors that I love so dearly, were put on a shelf along with my blog, Flickr, Instagram and Facebook activities. And, although I had a great time teaching in last year's "21 Journaling Secrets" class, my classroom participation was extremely limited due to my family's needs and obligations. My art life and world seemed to have stopped cold. 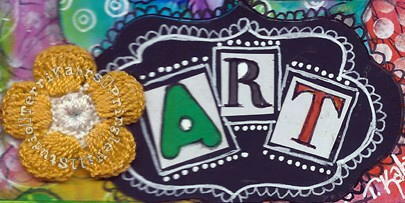 When I did have an opportunity to play, my colors and the intuitive artistic sense that I'd once relied on were "gone". The art that had flowed so easily in the past, now seemed forced and unnatural . . . I feared that my "colors" had disappeared never to be seen again. A good friend told me that my colors were still "inside" and that they were "hibernating". What a lovely thought . . . how I wanted to believe her!!! Enter 2014 and The Documented Life Project. Hmmmm . . . . I thought! Why not give this project a try? 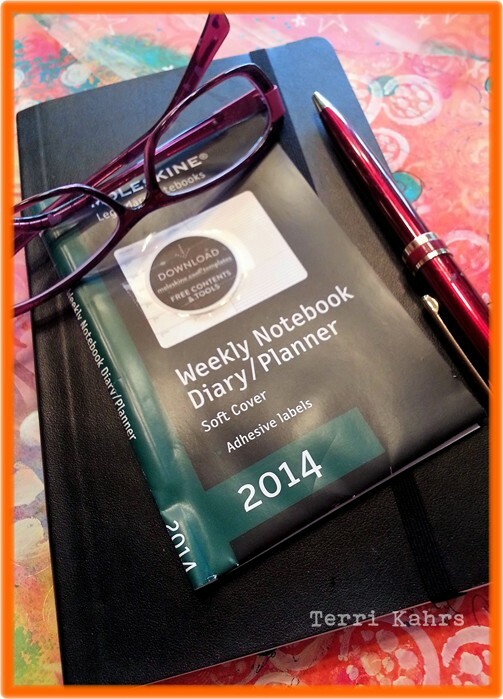 All that I needed to do was purchase a 2014 planner to use as a journal, join the Facebook site for the project, and look for one prompt a week. What a great way to get back into my little studio, I thought. Why not play? Why not experiment? Why not try to rediscover and reclaim who I am? Why not do art for the sake of pleasing myself without any expectations? 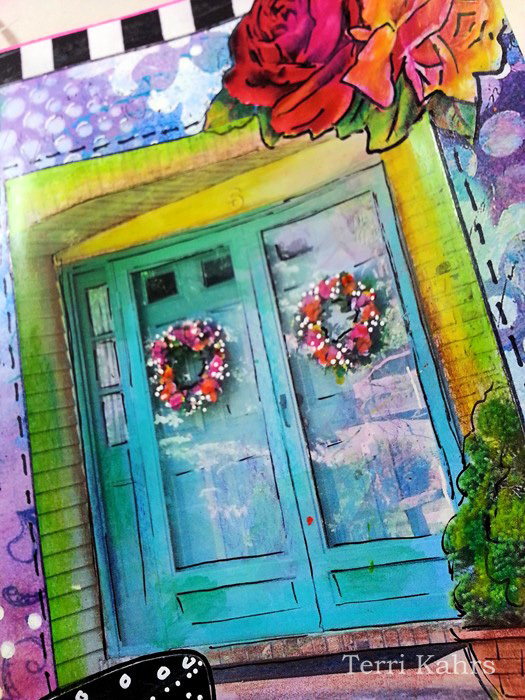 I took a deep breath, opened my planner, went to the website and read the first prompt: "Take a picture of your front door. What does it mean or symbolize to you?" I chose a picture of my front door, and started to play. Out came the glue, the Prismacolors and the Derwent Inktense pencils. Out came the watercolors, acrylic paints, markers and Sharpies. Out came the images that I so loved. And before I knew it, I'd finished the prompt, and the first week's spread was finished! Only 51 more prompts to go! Although my colors hadn't "flowed" quite as easily as they had before . . . . they were still there . . . bright and beautiful. My friend was right . . . . they'd been waiting for the right moment and the right project so they could be released. If you think you'd like to participate in "The Documented Life Project", please click here or on the badge located on my right sidebar. 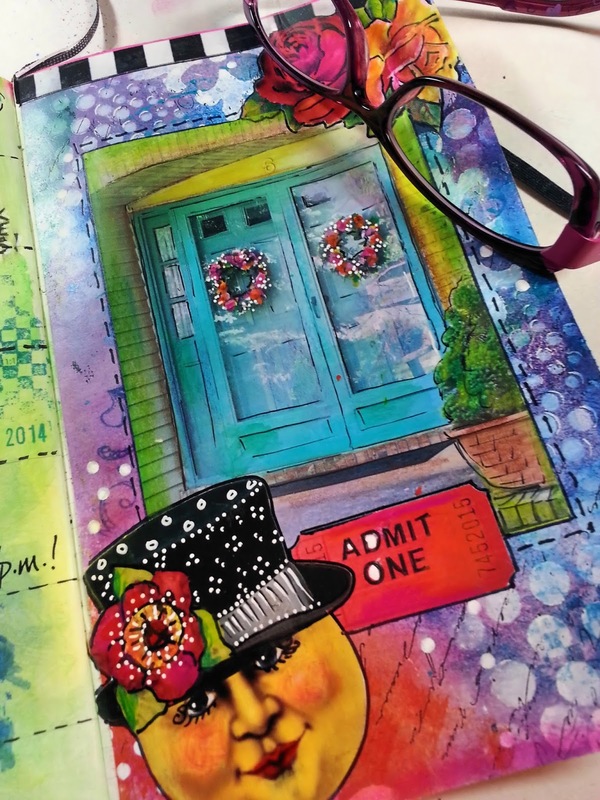 It doesn't matter if you're a beginner or a seasoned art journaler. The group is wonderful, fun and very supportive. I hope to see you there! 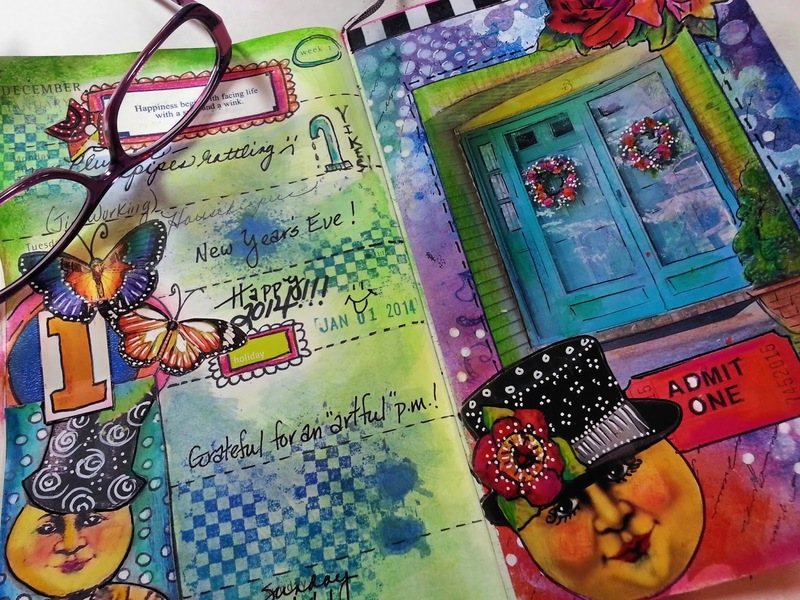 May you have a very colorful and creative 2014! Let your colors flow!